Malaysiakini : Umno president Ahmad Zahid Hamidi said today that funds from welfare foundation Yayasan Akal Budi were used to clear credit card debts, but claimed that this was due to a mistake by his officer. 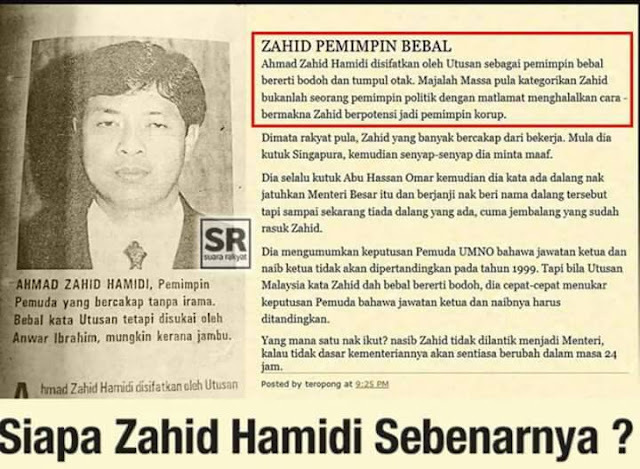 According to Zahid, the credit card bills were handed to his officer who "mistakenly used funds from Yayasan Akal Budi" to clear the debts – which required the former deputy prime minister to reimburse the fund using his personal money. "My officer didn't intend to misuse the funds (to clear the credit card debts) but the action was improper. "I have explained all this to the MACC and handed them the related documents (as evidence). "I used my personal money to refund money used from the fund in 2016," he explained. Zahid was speaking to reporters outside the MACC headquarters after an intense seven hours of questioning.